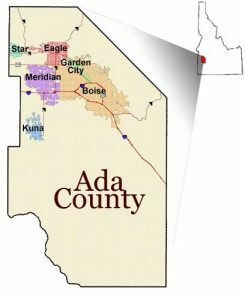 Ada County government is comprised of 11 county departments and seven elected offices. The county contains six cities: Boise, Meridian, Garden City, Eagle, Star and Kuna, and lies within the Boise City-Nampa, Idaho Metropolitan Statistical Area. Ada County is a great place to live, work, and raise a family. Whether it’s the vibrant cultural and recreational opportunities available, the friendly people or the mild climate, Ada County and its surrounding communities afford a quality of life second to none. Good jobs, affordable housing and safe communities make Ada County a great place to call home!